A glimpse behind the scenes. At OMEGA TECHNOLOGY PLASTIC GmbH & Co. KG we implement innovative ideas and concepts to deliver exceptional market-driven product solutions. Our reputation is built upon the close working relationships we have developed with our customers for over 40 years. We pride ourselves on our ability to provide comprehensive support right from the project planning stage through to the manufacture of plastic components that meet the highest technical standards. We develop and manufacture plastic components for a wide range of technical applications using injection moulding processes. Our products are in high demand from customers from all over the world and from a range of industry sectors. A high proportion of our customers are from the automotive industry and the electrical and electronics industries, however, we also supply the agricultural sector, consumer goods industry, furniture industry and the systems and mechanical engineering sector. We offer an expert and reliable service and always stand side by side with our customers right from the first project meeting through to the final on-time delivery. We respond to your exact requirements and always determine where potential cost and efficiency savings can be made which is information we put to good use for our mutual benefit. Our company mission statement is based on Christian values which place the individual at the heart of what we do. Our mental state, families, friends and work are tightly interwoven and cannot be viewed in isolation. This is why we view our employees and business partners as part of a complex network consisting of relationships and commitments. We are convinced that this is best way to combine personal fulfilment, success and a spirit of partnership. ONE TEAM. ONE VISION. We live and breathe our company slogan and always embrace the challenges set by our customers. Our customers highly value the quality of our products. This is not just demonstrated by the number of quality assurance awards we have earned but also by the fact our products are used millions of times in all motor vehicle categories. Our project team and technical sales team will provide you with plenty of advice during the quotation phase. We will support you during the enquiry phase by carefully analysing the components to ensure they are designed to be production-ready. The tools are constructed in one location and the whole process is carried out and monitored by our dedicated team of tooling engineers. We access a network of tooling suppliers who are located across the world. This ensures that we have the optimum manufacturing conditions in place to produce high-quality and reliable products. Quality and environmental management which is always up to date and of the highest quality. Our modern quality management methods ensure that all our components are of the highest quality. OMEGA TECHNOLOGY PLASTIC operates and is certified in accordance with the IATF 16949 quality standard. Since the company was founded, the name OMEGA TECHNOLOGY PLASTIC has been synonymous with experience, expertise, reliability and innovation in plastics technology. During our company’s history, we have evolved into a highly regarded and reliable supplier of leading industry sectors such as the automotive industry both in Germany and across the world. Our company’s success is firmly rooted in providing top quality products, developing close partnerships with our customers and providing a dedicated and flexible service. This success is demonstrated by the continuous development of our manufacturing facilities in the town of Diepholz in Lower Saxony, Germany. Installation of another fully automated production and assembly system for the manufacture of ball bearing cages for seat rails. Jürgen Exner is appointed Managing Director. Installation of two fully automated production and assembly systems for the manufacture of ball bearing cages for seat rails. Polyurethane sealing technology and polyurethane moulding technology. Walter D. Olbert acquires shares in the company from P+S (Injection Moulding Technology) through a management buyout. 30 employees are responsible for generating a turnover of 2.4 million euros. The manufacturing processes are carried out on 15 injection moulding machines located in production space measuring 600 m². The company is divided into three business divisions. Company headquarters move to Diepholz. There are excellent facilities in place in Diepholz which enables the company to develop along positive lines and to expand its factory facilities to accommodate additional injection moulding technology and to enable polyurethane elastomers to be processed. Establishment of the company P+S Plast und Schaumtechnik GmbH & Co. KG. 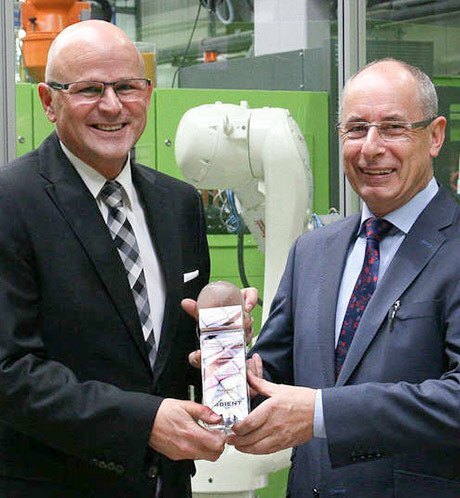 Dieter Kolthoff establishes the company P+S Plast und Schaumtechnik GmbH & Co. KG in Lemförde. The company focuses on manufacturing injection moulded components. Are you seeking an opportunity to meet new challenges and to enhance your professional development? You have come to just the right place here at OMEGA TECHNOLOGY PLASTIC! Our company name is synonymous with team spirit and quality. Why not join us and be part of a team that is always striving to be better! We can offer you an opportunity to undertake a variety of tasks in various departments. Please scroll down to view our current vacancies for jobs, training positions and work placements. Alternatively, you are welcome to send us a speculative application which you can do by completing our application form. 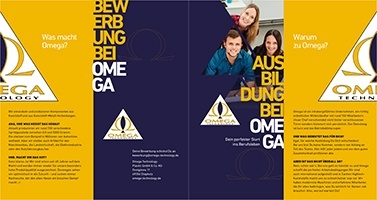 We look forward to hearing from you and maybe also welcoming you to the OMEGA team! Managing projects from when the plastic components are ordered throughout the whole project lifecycle (from order placement to when the series is released). Planning, documenting, managing and implementing projects. You will have completed your professional training in plastic injection moulding as a process or tool mechanic. Experience working as a plastics technician would be advantageous. Excellent knowledge of tool and article design and of project management. Experience of calculating and creating quotations. Confident in business situations with good presentation skills. Good knowledge of English in both the spoken and written form. Able to work independently and in a structured way. Able to work confidently with most common computer systems. To set up thermoplastic injection moulding machines. To control and optimise the manufacturing processes. To inspect and safeguard quality throughout the manufacturing processes. To set up extraction and handling systems. To provide support to the maintenance of the injection moulding machines, injection moulding tools and their peripheral components. You will have completed your professional training as a process mechanic in plastics and rubber technology (m/f). Several years’ professional experience with sound specialist knowledge. Willingness to perform shift work. Experience of working with various types of injection moulding machines and control systems. To pick orders following the order date list, the FIFO method and the proposed mode of dispatch. Marking and labelling of consignments using the four eyes principle. Providing support to the warehouse. You will have preferably completed your professional training as a warehouse logistics specialist. You will ideally have had experience working in the plastics industry.